A dark Italian-style roast with a rich crema layer and a serious kick. NESCAFE Dolce Gusto Barista. A very intense dark roast coffee. Shorter than a classic Espresso (35ml). Intensity of 9 out of 11. Aromatic coffee with a syrupy, full body, and a dense crema.Discover NESCAFÉ® Dolce Gusto® Barista, a very intense dark roast coffee. A short cup (at 35ml), with an intensity of 9 out of 11, this is an aromatic coffee with a syrupy, full body, and a dense crema. Savour the balance between notes of roasted cocoa with a lively citrus acidity in this full bodied short cup. 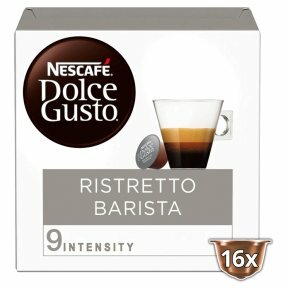 The box contains 16 capsules designed for NESCAFÉ® Dolce Gusto® capsule coffee machines for you to prepare 16 cups of Barista. Easy to Prepare Simply slide your Grande capsule into your NESCAFÉ® Dolce Gusto® machine. Your coffee will be ready right away.